What is your favorite kind of vacation? For some people who live a long distance from their relatives, vacations are all about going home, seeing loved ones and reconnecting with the people and places that make up their “roots.” For other people, a vacation is all about relaxation—think white sandy beaches, a good book, an afternoon nap and no particular agenda. For an increasing number of people, a great vacation is synonymous with adventure. In fact, one of the fastest growing segments of the tourism industry is “adventure travel.” Rather than looking for some down time, more and more people want to experience the world through exciting, arduous, even risky adventures. This might mean trekking through a jungle, climbing a distant mountain or cycling through a developing country. Whatever the nature of the adventure, the common theme is the desire to be connected to nature, engaged with another culture and/or challenged to their physical limits. Travel experts divide these adventures into two categories: “soft” and “hard.” A “soft” adventure involves getting out there but not getting too far away from the evening buffet. Think of going on an African safari, for example. Out there on the savannah, you are not the highest life form on the food chain, but you have the advantage of being in a protected vehicle where you get to view the danger through a camera lens. Or, snorkeling. You can get up close and personal with sea life in shallow water without worrying about a pulmonary embolism ruining your vacation and your life. A “hard” adventure, on the other hand, would involve hiking and camping on the savannah with no steel bars to protect you, or donning scuba gear and heading down into the depths of the ocean. Think of mountain climbing, riding your bike through the Middle East or taking a 1,000-mile walk, for example, and you get the idea of a “hard” adventure. For these types of adventures, it’s best to have a guide service to direct you and keep you on track. A good adventure guide service will help you plan your trek and make some of the arrangements for your lodging, meals and dealing with your baggage. The service will provide a good packing list, the extra equipment you might need, maps and directions, and they’ll even monitor your progress. One way to look at Jesus’ last words to his disciples, part of which we have in John 14, is to see them as an advertisement for the “hard” adventure they have ahead of them. The Twelve had already followed Jesus up and down the hills of Galilee, on the long road to Jerusalem, and through the deserts of Judea. They had been in storms that might have drowned them, confronted demons that terrified them and seen miracles that blew their minds. They had been with Jesus every step of the way as their guide, but the time was coming when Jesus would trek to the cross, the grave, and then to the right hand of the Father. He would soon be leaving his friends behind to continue the adventure without him. Both Peter and Thomas had previously requested Jesus’ itinerary (13:36; 14:5), but as Jesus delivers his parting words, he keeps the focus on how his disciples will continue his mission on the journey ahead. For that adventure, they will need a Guide, and Jesus promises to send them the “Advocate,” the Holy Spirit, “the Spirit of truth who comes from the Father” (v. 26). As the Spirit has testified to Jesus’ person and mission, the disciples will now take that testimony to the rest of the world. It will be a “hard” adventure because that testimony won’t be welcome in a world that is hostile to the truth about Jesus. “They will put you out of the synagogues,” Jesus warns. “Indeed, an hour is coming when those who kill you will think that by doing so they are offering worship to God. And they will do this because they have not known the Father or me” (vv. 2-3). You couldn’t blame the disciples for thinking that heading for the beach with a good book would be a safer use of their time. This is going to be a tough trek, Jesus tells them, but it’s a necessary one if the good news about Jesus is going to reach the distant cultures and remote places of the world. It’s going to take some willing adventurers who will travel light with gear but be burdened with the need to speak the truth about what God has done, about God coming to the world in the flesh to bring light to the darkness and life in the midst of death (1:1-18). Jesus had come into the world and was on his way back to the Father, but the disciples were now focused on themselves and what they would be doing. They don’t ask Jesus where he’s going anymore; the question for them is, “What’s going to be our destination and how do we get there?” (v. 5). It used to be that hiring a guide meant that you would have someone directly on the ground with you in whose footsteps you would follow to get to you destination. While that’s still true for many adventures, technology has made it possible for you to be guided virtually instead, tracked by GPS and connected via radio, or mobile or satellite phone to a guide who is always monitoring your progress with the big picture in mind. Jesus is saying something similar to his disciples. They won’t have Jesus as their on-the-ground guide anymore, but Jesus tells them that’s a good thing. Sensing their sorrow and confusion, Jesus promises them a new Guide who will help them expand their trekking capacity and keep the big picture in mind. “It is to your advantage that I go away, for if I do not go away, the Advocate will not come to you; but if I go, I will send him to you” (v. 7). As the Guide, the Holy Spirit will point out the twists and turns in the route ahead and help the followers of Jesus know what to look for as they trek into the world. Jesus tells the disciples that their Guide will point out four wrong paths that the world has taken — paths that their proclamation of the gospel, in the power of the Spirit, will correct (v. 8). First, the Holy Spirit Guide will help us with the problem of sin (v. 9). The metaphor, if you want to extend it, is that the Holy Spirit will help us to not stuff anything into our backpacks that is essentially worthless for the trek we’re taking. There’s no need to be overburdened. We don’t need a hairdryer, the laptop, or canned goods for this trip. But that’s all wrong. The biggest problem of sin is not what we do with our hands, but who we are in our hearts. Not what we do, but who we are. Acts of sin are caused by a sin nature, by a predisposition to sin. The Holy Spirit helps us conserve a lot of spiritual energy by understanding that in the adventure of life, Jesus has already done everything for us. Christ’s work frees us from the burden of “trying our best”—and the guilt and shame that inevitably comes when we fail—so that we can simply do the work God has given us to do. Second, the Holy Spirit Guide helps us in doing good (v. 10). This is the flip side of what we just said about sin. In this case, the Holy Spirit helps us stuff our pack with good things, with the right things. Again, many people think that goodness is something we do. Thanks to the Guide, we know that goodness is not primarily about doing, but about being. For our journey, the Holy Spirit provides us with a new nature, a new heart; we are made to be a “new creation”! Unfortunately, the world’s idea of righteousness is that the more good we do, the more righteous we are. The Guide, Jesus says, will help his followers see what true righteousness looks like, using Jesus himself as the model. He may be returning to the Father, but through the Spirit he will continue to guide us and empower us to do what he has done. Indeed, we will do even greater things (14:12-14). Third, the Holy Spirit Guide will help us with the route (v. 11). The Holy Spirit Guide knows where we are going. We often make poor route choices because we begin with faulty premises and an insufficient understanding of the terrain. What the world thinks is important is usually not important. What the world thinks is wise is often pretty foolish. The world thinks success is measured by material things. The world thinks that greatness is when people are your servants. The world thinks that the one with the most toys wins. The world thinks that wisdom comes from being highly educated. The world promotes a “me-first” mentality. The world values pleasure, popularity, power and position. The Holy Spirit Guide helps us reverse these judgments. Success is not measured by material things. The greatest among us are the servants of others. The wisdom of the world is foolishness to God. Selfishness is not a virtue in God’s kingdom. Because it feels good doesn’t make it right. By understanding how God judges or looks at things, we will be able to make good decisions. Finally, the Holy Spirit Guide will help us with the Truth (v. 11). “When the Spirit of truth comes, he will guide you into all the truth; for he will not speak on his own, but will speak whatever he hears, and he will declare to you the things that are to come,” says Jesus (v. 13). “Truth” is a major theme in John’s gospel. In fact, it will be Pontius Pilate who asks the question on the world’s mind as they are confronted with Jesus: “What is truth?” (18:38). The truth is that Jesus himself is the way, the truth and the life (14:6). Which is to say, if we emulate Jesus, our lives will not be a lie. Our lives instead will be lives of integrity, honesty, service, selflessness and humility which are all counterintuitive from the world’s point of view. If disciples want to follow Jesus where he is going, then that means following his way, his truth and his life in spite of the dangers and twists and turns ahead. The only way to navigate that way is with a Guide who will take what Jesus has said and done and “declare it” to us so that we will glorify him (vv. 14-15). 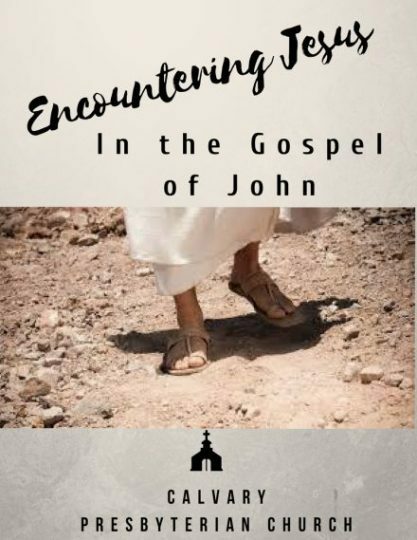 John’s Gospel reminds us that when the Guide arrived, he launched the disciples on a new adventure. Following Jesus has never been about retreating from the world to a tropical island and “getting away from it all.” It’s always been about following the way, the truth and the life of Jesus for the purpose of changing the world for God’s glory. It’s a tough adventure, but it leads us to the only destination that ultimately matters. So, let me ask you: are you ready to pack your bag and follow Jesus on a grand adventure? Yes, it’s scary. It’s risky and maybe even dangerous. But we do not go alone. The Holy Spirit promises to lead us—and promises us peace for the journey. Thanks be to God. Amen.